For those who want to read these posts on the Early History of Cherokee Village, please see that there are 8 pages of posts. You want to begin with page 8. The post runs in reverse order for some reason. Also, I found something pretty interesting for those who follow the famous local architect E Faye Jones. Jones designed many buildings in CV. As many know, Jones was a student of Frank Loyd Wright. There is a website called "Save Wright" that has some posts of CV and E Faye Jones. When I look at these postcards and read the Early History of Cherokee Village, I always sense both community vision and excitement at being a "Villager." Both are essential. So much was built up in those early days to sustain the community long-term, including the hospital. We certainly need a real hospital again. If we got one, local employment would surge and young families could have a future in the area and older people retire with all the services they need. John Cooper clearly knew that and it can happen again! Keep the dream going and keep the CV spirit proudly alive! Just when I thought the enormous past history of Cherokee Village's early years had been pretty much covered in these posts, a new piece was discovered. Fellow Forum member Chuck sent me a nice new calendar and CV front license plate. The calendar has some fantastic photographs of the area and one photo from the early history of the Village that I had not seen. It is entitled: "Coffee & Candy Shop, Cherokee Village." It is a really great photo of an old fashion soda pop and candy store. The picture appears in the FNBC bank calendar and is attributed to Jeanette Graham. Thanks Jeanette! If folks have any other photos of the early history of the Village, it would be great to have them copied for the CV Historical Society. Does anyone remember the old Candy & Coffee Shop? Here is the link. I put these online a few years ago. Just saw a postcard of folks eating in the old Sitting Bull Restaurant circa 1970. The glory days! also saw a postcard of the old Welcome Center. It really was hopping in those days! And hop again it can! Yes this topic has been one of the best on the forum. 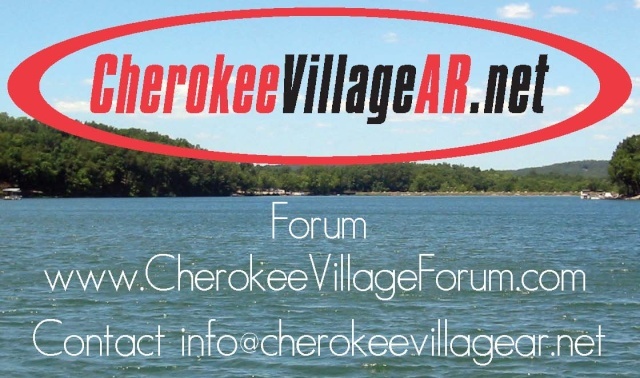 Always fun to read these posts on the history of Cherokee Village. I'm really pleased that this section has been so popular for so long. We have had a huge number of views. The Early History of Cherokee Village is nothing short of amazing. I want to invite others to share historical information here that they feel may have been overlooked. Please feel free to share your own personal reflections or history that you have live through. One thing that I would like to speak of personally is how warmly welcomed I felt when I purchased my home through King Rhodes. They gave me a welcome packet and a free years subscription to the Village Journal. Jackie worked frequently with me thereafter to get me connected and I want to thank her and KR personally. I keep being interested in the Kia Kima Boy Scout Camp history. One of the more helpful things I have found comes from the links on the following Scout's website. The thing that I don't understand is the interplay between the "old" camp that John Cooper traded in a land swap. It seems that despite Mr. Cooper's giving of a better location and even buildings some folks are trying to hold fast to the old camp site and its restoration. If anyone understands all this, I would love to hear the details. In answer to my own question, I have bought from 500 to 2,500 in the past 8 years. But I know some of these lots might have been 12,000 at one time. Especially early on. I've seen lake lots go from 7000 to 110,000 over the past 8 years. Obviously. location matters greatly. Things are sure undervalued at the moment. The value of CV lots has little to do with the real value of living here. One topic that hasn't been explored here is the fluctuation of lot prices through the years. I would be interested in hearing from folks about lot prices tbrough time from the beginning of CV through the present. Obviously, the type of lot matters -- lakefront, inner, golf course, etc. I would like to restart this popular thread and invite others to share "insider history" we have not covered that may be of general interest to those inside and outside the Village. One curiosity of mine is the Cherokee Village Historical Society located in the Omaha Center. How many folks have ever visited it? Would anyone want to encourage a presentation by the members of the Historical Society to kind of give us a "best of" the archives. Remember, it is their work in the booklet the Early History of Cherokee Village that has made this thread what it is. Thanks. One bit of the "early history" that has intrigued me is missing here. If anyone has any info on the role of the railroad and the Hardy station I would love to hear it. Clearly, the railroad had a lot to do with Mr. Cooper's first introduction to the area from Memphis. I'm wondering to what extent it played arole with potential buyers of lots and otherwise in the growth of Cherokee Village. Anyone know anything about that? Prior to 1880, Hardy, AR did not exist. Only a few families lived in this heavily timbered area, and not until the completion of the railroad did the boom times come. Thanks to the railroad, much was needed - a water tank to service locomotives, a station to take on and unload passengers and freight, housing for its employees, and various other services. The town of Hardy was officially founded in 1883, and was named for James A Hardy, Jr., a 25-year-old trackage subcontractor who saved his boss's life. Also, "Born and Raised in the South" offers a very interesting overview. Still, I would love to know about the impact on CV's development. Any info? Thanks for your post. It appears that there is a dedicated group of Scouts with cherished memories of their time at the camp. They were determined to bring things back to those glory days. It is great that the wood boards with the names carved in them still are there as a witness to that history. John and Mildred Cooper were both deeply committed to Scouting. There's some interesting stories of that in the Early History of Cherokee Village. Our house is just down the street from the camp I have watched them slowly rebuild the camp. If you have not seen it, it is worth the walk to walk the camp area. They have done a great job for the future scouts. Also what is neat is they saved some of the old inside boards that the scouts of years past put their names and dates on. Once the lodges were restored they hung the old boards with the names and dates back in the lodges they came from. Also the covered bridge is a sight to see. The fall is a great time to walk the camp. Check it out. Old camp Kia Kima traces its history back to 1916, shortly after the Chickasaw Council of the Boy Scouts of America was organized. Mr. Bolton Smith, a Memphis, Tennessee investment banker and the first president of the Chickasaw Council, purchased and donated the original Kia Kima site. Bolton Smith went on to serve as vice president of the Boy Scouts of America and is the only Chickasaw Council Scouter to ever receive the Silver Buffalo award, the highest award presented to adults by the Boy Scouts of America on a national level. The name chosen for the new camp then was Kia Kima, and could hardly have been more fitting. The main campsite was to be situated on a bluff overlooking a pristine riverfront on the South Fork of the Spring River, in Sharp County, Arkansas. Kia Kima, in the Chickasaw Indian native language, means "Nest of the Eagles". Through the years, this area of Arkansas, in the foothills of the Ozarks, became a center of camping and outdoor activity. One of the first camps in the area, Kia Kima, attracted other camps and was instrumental in the continued development of north central Arkansas. The first Scout Executive of the Chickasaw Council was a young man named Edward Everett. He also served as the first camp director of Kia Kima. His wife served as the director of a nearby girl’s vacation camp. The Hardy, Arkansas area, where old Kia Kima was located, was a logical choice for a summer camp. Many Memphis families had vacation homes there, where they traveled to escape the oppressive summer heat in the city. Hardy was a short four-hour train ride from Memphis. In the early days, Scouts came to the camp as individuals, mostly because in those days few Scoutmasters could arrange for a week off from work to accompany their troops to camp. Later, with growth in the scouting movement in Memphis, more and more troops began to come to camp as a unit, and learn and practice organizational skills as well as individual camping skills. A special sash was presented to Scouts who qualified as good campers at the old camp. The camp provided many activities including camping, cooking, swimming, pioneering, life saving, canoeing, rowing, handicrafts, archery, a rifle range, field sports and games and plenty of hiking. In 1925, Chickasaw Council acquired Camp Currier, near Eudora, Mississippi and in the 1930s began to expand that site to include summer camping. Camp Currier was little more than an hour from Memphis and the proximity and familiarity of the closer camp help in increase its use and lift some of the overcrowding from Kia Kima, which had grown very popular with scouts and their leaders. As a result of transportation costs and a shortage of supplies and leadership, Kia Kima was closed for summer camping during the World War II years. The camp reopened in 1948. In 1948, the Chickasaw Council adopted the Order of the Arrow, an honor camping brotherhood, as a part of its camping program. Chickasah Lodge of the Order of the Arrow was founded at Kia Kima and held its first Ordeal Ceremony there that year. The Order of the Arrow program has played a vital role at Kia Kima ever since, enjoying the recognition of those scouts and leaders whose spirit, character, and integrity best represent the Scout Law and Scout Oath or Motto. The 1950s and 1960s were a tremendous growth period for the Scouting program in the Memphis area and the use of Kia Kima grew during those summers. The lodges were no longer the preferred method of Scout camping. By this time, most troops were coming to camp under their own leadership. Many more campsites were needed to accommodate the additional troops wanting to attend summer camp. There was little room left for expansion on the then existing 160-acre tract. By the early 1960s, the Council's Executive Board was seeking property alternatives. West Memphis, Arkansas businessman John Cooper had owned property in the Hardy area adjacent to the existing Kia Kima property and in the late 1950s and early 1960s conceived of and developed the Cherokee Village resort community near Hardy. From Cherokee Village's beginnings, the Village and Kia Kima were good neighbors. Over the years Mr. Cooper supported the old camp in various ways. He provided a water supply pipe, a rifle range, a septic field and numerous other services. The land where Kia Kima was located was in the heart of Cherokee Village, and Mr. Coopers continued development of the community made his acquisition of the Scout property desirable. In the fall of 1963, Mr. Cooper approached the Council's Executive Board with a proposal to exchange a 540-acre tract a few miles upriver from the old camp on the edge of the sprawling Cherokee Village for the 160 acres of the old Kia Kima property. In addition, his construction crews would build a dining hall, water system, other buildings, roads and a lake for the new camp. After deliberation, the offer was accepted and work began immediately on the new camp Kia Kima. The new camp was ready for its first camping season in 1964. The new camp continues to be used extensively during the regular summer season, and the Council has added improvements over the years since to enhance the camping experience for those Scouts able to squeeze in a week or more in their busy youth summers. Cherokee Village continued to be developed in the 60s, 70s, and 80s and became a popular retirement community as well as an exciting summer vacation destination for persons of all ages from around the Arkansas, Missouri, Tennessee, and Mississippi adjacent areas. The original old Kia Kima lodges and buildings became abandoned in place and the immediate property surrounding the buildings was itself soon surrounded by the advancing development of retirement or resort properties within Cherokee Village. Weather and age took their toll on the wooden roof structures and support beams for the Kia Kima lodges, and by the early 1990s the lodge roofs were caved in and the remaining natural field stone base foundation mortar was beginning to deteriorate. The immediate old camp property, the few acres providing a perimeter around the original buildings and lodges, also became an eyesore due to its use as a popular dumping site for trash, old appliances, and evidence of vandalism was apparent. The year was 1993, and it was the fall of the year when four former camp staff members came back to Old Kia Kima thirty years after the camp had closed. Those who are reading this will understand why. It was the Spirit of Old Kia Kima that brought them back, drawing them like a magnet to rekindle the fond memories of another time and another place that still burned brightly in their hearts after so many years. It was forty years from when they were first at camp, yet they came back to remember when they were young men and shared the unique common bond of this former Boy Scout Camp on the South Fork River. Yes, it was also an opportunity to renew friendships, but the real draw was to pay homage to that magic place that turned boys into men. It was a place that had taught the values of Integrity, Achievement, Responsibility, and Courage with experiences that wrote in indelible ink on the fabric of their character -- just as had been the case for so many that came before and after them. Two of the original four, David Fleming, and Gordon “Scotty” Monteath, returned to Old Kia Kima again in 1994 joined by Roy Riddick, John Hurt, and Lofton “Buddy” Keltner. They were appalled at the deterioration of the property and its misuse over the years. The camp lay in ruins, the roof of the lodges and Thunderbird Lodge had succumbed to the ravages of time and neglect, caving in long ago, with a tangle of trees and vines growing up from the decayed wood on the floor. Old refrigerators and discarded washing machines littered the grounds. It was heartbreaking, but it was also inspiring because they saw clearly in their minds eye exactly how the camp used to be – and how it could be once again! Haunted by what they saw that fall day in 1993, and the return trip in 1994, these five former staff members were inspired with the Dream and the Vision to go on in 1996 to become the founders of The Old Kia Kima Preservation Association, Inc.
A watershed event occurred in 1998 with the purchase and donation by Boyce and George Billingsley of the forty-three acres that was the core of the old campgrounds. With the land under the ownership of OKKPA, the Dream of a restored and once again fully functioning Old Kia Kima easily spread from the original five founders, to “work parties” for cleaning up the grounds, and from there to active and vibrant Board of Directors and Restoration Committees that worked hard to make the Dream come true. The Dream grew stronger and was quickly taken up by the OKKPA membership who pitched in with donations, encouragement, and moral support. In the spring of 1999 a new Bathhouse facility was built, and restoration began on the 16 original stone lodges flanking the Quadrangle. By the fall of 2000 the lodges were fully restored and work began on the restoration of the Thunderbird Lodge. A Group Cooking and Dining Pavilion was built in early 2001 along with a Camp Office, walk-in cooler/freezer, and Storage area built around the original old pump house. The Dream was taking shape to the point that it was obvious to everyone that we were going to make it come true! These restoration efforts were quickly followed by a restored Camp Staff Lodge, known as the “Rat’s Nest”, which was dedicated to George Billingsley in the fall of 2001. By the Spring of 2002 restoration of the Thunderbird Lodge was nearing completion, and a new Covered Bridge over Spirit Creek was taking shape to connect the Quadrangle with the majority of the property to the east. All that remained for this Dream of a fully restored and active Old Kia Kima to become a reality was the presence of Scout Troops once again occupying the lodges of Old Kia Kima. On May 17, 2002 the Dream came true when the camp was officially opened to Scout camping for the first time in 39 years Two Boy Scout Troops marched into history late on that Friday evening. Troop 190 from Southaven, MS arrived first with Keith Keel in charge. They had 9 leaders and 11 Scouts occupying Lodges 2- 6. Troop 457 from Memphis arrived later with Steve Taylor in command with 7 leaders and 22 Scouts. They stayed in Lodges 7-10 and 12-15. On June 16, 2002, David Logan’s Troop 55 from Nashville, TN became the first Boy Scout Troop in 39 years to spend a week at Old Kia Kima, followed on August 4, 2002 by Steve Demster’s Troop 187 from Clarkson, MI. Many additional Troops came to Old Kia Kima that first year of re-opening, while the restoration efforts continued through the fall of 2002 to included a new Campfire area with natural “amphitheatre” seating and Totem Poles, along with a Pioneering Project “Barn” near the newly developed camp activity area on the east side of Spirit Creek. Yes, the Dream really came true, and in the process provided for future generations to be exposed to a timeless place where the Spirit of Old Kia Kima now lives on in perpetuity. The Spirit was rekindled for the Youth of Tomorrow to once again have the life shaping experiences that a restored and fully functioning camp offers, in that magic place “High Above The South Fork Waters”, that turns boys into men. Today, the members of the Old Kia Kima Preservation Association remain proud of what was accomplished in such a short period of time. Working together with that Old Kia Kima Spirit during the years 1993 through 2003, the OKKPA Board Members, Officers, Committee Members, Donors, and the membership at large made The Dream Come True! Their vision and hard work insured that as many of the Youth of Tomorrow as possible would have that special experience, high above the South Fork waters, known as Old Kia Kima. Much has been shared here with great admiration and gratitude for the work of Mildred B. Cooper, wife of Mr. John Cooper, and her contribution to establishing Cherokee Village and its spirit. As we have read here, Mrs. Cooper's illness later in life required that she move from the Village for medical care. I did not know that Mrs. Cooper was built a memorial Chapel by the famous architect E. Faye Jones who as we know has several building in Cherokee Village. Here is a link to Mrs. Cooper's Memorial Chapel in Bella Vista. In 1960 John A. Cooper Company established Quapaw Water Company with Raccoon Springs being the main source of water for residents of Cherokee Village. In 1973 Roaring Springs was developed and became the main source of water for Cherokee Village residents. In 1984 all the water line construction was completed thus making water service available to all areas with paved roads in Cherokee Village. in 1985 Quapaw Water Company was sold by Cooper Communities (John A. Cooper Co.) to General Water Works of Pennsylvania and was investor owned. From 1985 to 1988 General Water Works made several needed capital improvements to the water system. In 1988 several public meetings were held and it was determined by the property owners it would be in the best interest of the Village and its residents to form a water association and purchase the water company from General Water Works. In doing so, the company changed from Quapaw Water Company to Cherokee Village Water Association and earned revenues were turned back into the system which resulted in major improvements to the system. In 1994 re-organization and refinancing of the existing system was done in order to take advantage of lower interest rates which resulted in a savings to our customers of almost $500,000 over the life of the loan. Thereafter, the company became Cherokee Village Waterworks Facilities Board of Sharp County, Arkansas, a government entity of the county. This enabled the company to sell tax exempt bonds for future expansion or construction as needed, at the best interest rates." I mentioned in another post "Little Things I Love About Cherokee Village that both my son and I like the rocks and ocean fossils. It isn't much know that Arkansas was once long ago under the ocean. there is tons -- literally -- of evidence all over the place in the Village. During the Paleozoic, all of Arkansas was covered by the ocean. In the northern part, the ocean was relatively shallow, and marine organisms were abundant, while farther south the water was much deeper. Occasionally, areas would rise above the water level and then subside again or be eroded away. Whether microscopic or larger, many marine plants and animals have shells composed of calcium compounds. As they die, their shells can accumulate on the bottom, as they often did in what is today northern Arkansas. Farther south, in what is now central and southern Arkansas, the ocean was deeper, and sand and clay were the primary materials deposited. Under pressure and the appropriate chemical conditions, calcium shells and skeletons became limestone, sand became sandstone, silt became siltstone, and clay became shale. These are the predominant rocks in northwestern Arkansas today. I haven't posted here in a little while. I will continue with the theme of the Water Works and its history. However, it occurs to me that I have been very neglectful of an important part of CV history. We have a number of buildings by E. Faye Jones. Here is a short bio with the link to the text at the bottom. Also you can see the Topic on this Forum for "The Ozarks and Surrounding Areas"
E. Fay Jones was born in 1921. He studied at the University of Arkanasas in Fayetteville and at Rice University in Houston, Texas. He also apprenticed with Frank Lloyd Wright before establishing a private practice in Arkansas. An unassuming architect, E. Fay Jones has worked quietly in the isolation of the Ozark Mountains for most of his career. Ignoring architectural trends, Jones has continued to refine the vocabulary of regional forms and materials that he learned as a student with the Taliesin Fellowship. Using Wrightean principles, tailored to his own aesthetics, Jones has created buildings that Wright might have proudly claimed. Jones shows a marked ability to translate fanciful sketches into built form. While many designers envision a structural framework clad with an outer skin of enclosing materials, Jones has actually created the vision. His two most renowned buildings - Thorncrown Chapel in Eureka Springs, Arkansas and the Mildred B. Cooper Memorial Chapel in Bella Vista, Arkansas exhibit a transcendental flair for the sculptural and the simple. Both are graceful, wooden, outdoor structures. Recipient of the American Institute of Architects Gold Medal, 1990. As I continue to look through the Early History of Cherokee Village, I start to ask myself if there are folks around who still remember certain things. For example, does anyone remember Village Liberty Supermarket owned by the Lambert family? It was located in Town Center and is referred to in a Villager article in 1966. If you remember Village Liberty Supermarket, what was it like? Apparently there was a 20 by 40 foot skylight. Interesting. This post will also appear under Highland High School. It is a reflection by Frank Morris taken from the Early History of Cherokee Village produced by the Cherokee Village Historical Society. I think that it is important with respect to the "Vision." Enjoy. The school site on which this building sits was donated to the school by Mr. John A. Cooper, Sr., then President of Cherokee Village Development Co., Inc. The site covers 72-1/2 acres. Mr. & Mrs. Cooper deeded this land on January 3, 1963. Bonds were sold and construction began. The Building covers approximately one acre of this site. This is one of the best constructed and most conveniently arranged school buildings in North Arkansas. It was built for expansion for the next several years. It consolidated the Hardy and Ash Flat school districts and known as Highland High School. This post will continue.... What I want to notice here is that Cherokee Village was clearly seen by Mr. Cooper as a part of a larger community. It seems also that Cherokee Village was envisioned to be more than a retirement community itself but also one with kids needing schooling. The gift of this much land is quite generous and shows how Mr. Cooper cared about the area as a whole. I mention this because occasionally one hears charges of insularity about CV. This is not supported by the facts of Mr. Cooper's vision. We would all do well to remember that the whole community has been lifted up by Mr. Cooper's work. 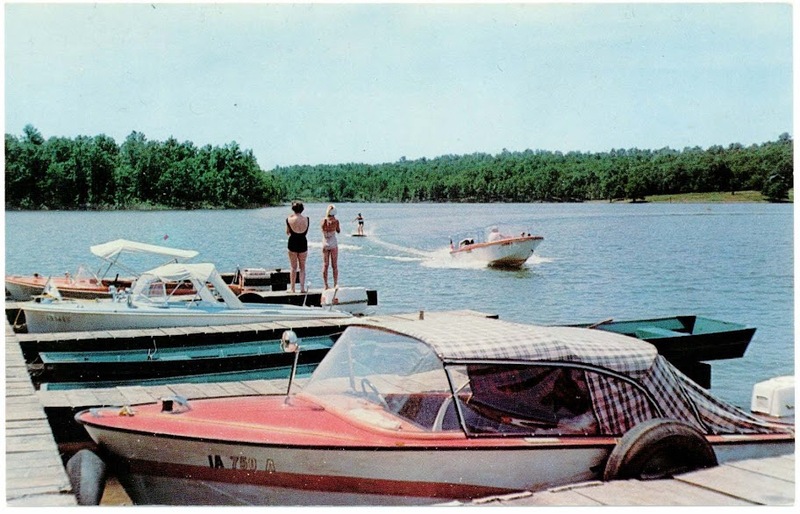 Here is my personal favorite, Lake Sequoyah back in the day! I have a bunch of old CV postcards also. A few of them are very telling about the early days of the village. I will take a few out of the frames and type what they wrote in a next posting. We have a collage of old postcards from CV and is always a great conversation piece.